Zoom and spin your way around the globe while viewing earthquakes in 3D. Adjust and customize the display to see earthquakes in a variety of different ways. Filter earthquakes by size and time - then select from many options that include quake indicators and map references. 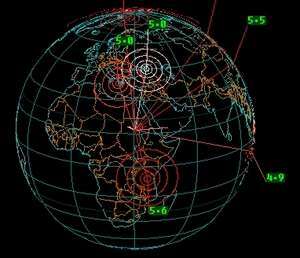 Earthquakes are shown in near real-time using the latest data from the USGS via the internet. For security reasons, you should also check out the Earthquake 3D download at LO4D.com which includes virus and malware tests. Additional screenshots of this application download may be available, too. Earthquake 3D has a presence on social networks.